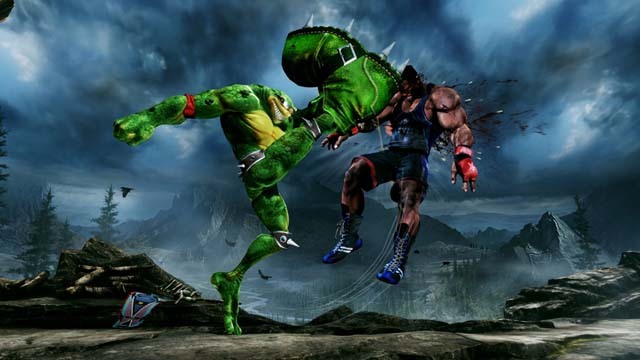 Killer Instinct’s 2013 reboot started out as nostalgia-fueled fanservice for die-hard fans of Rare’s classic fighter, but after two full “seasons” of content additions it has matured into a fantastic fighting game that can truly stand on its own. The cast is large and amazingly varied. The graphics keep getting better, the fighting is continually improved through balance adjustments and tweaks, and new modes have been added. It isn’t an overstatement to say Killer Instinct was a totally different game after Season 2 compared to Season 1. And now it all evolves again with Killer Instinct Season 3. Something important to note is that Killer Instinct is also now available on Windows 10 PCs, and online multiplayer is cross platform with Xbox One, so you don’t have to own an Xbox One to play KI now. Also good news is that if you own Killer Instinct on either platform, you can play it on the other platform – with all of the characters and other stuff you’ve bought - for free. Now on to Season 3. Killer Instinct is still technically a free to play game, which means you download the base game for free, which comes with Jago, and then each week a different character is available to try out for free. Whether you buy KI Season 3 or not, your copy of Killer Instinct will be automatically updated to add all of the new updates and enhancements and features and will also allow you to fight against the new characters online even if you don’t own them. If you do want to buy KI Season 3 (and of course you do), you can either buy characters a-la-carte for $5 each, or you can buy bundles that include all of the characters plus other goodies. You can buy the KI Season 3 Combo Breaker Edition for $20, that comes with all 8 Season 3 characters (4 available now, 4 to be released in the future). You can also buy the KI Season 3 Ultra Edition for $40, which comes with all 8 characters plus bonus costumes and colors and other stuff. It has to be noted that the Ultra Edition of Season 3 is a bit of a disappointment compared to the Ultra Editions for Season 1 and 2 considering they came with Killer Instinct 1 and 2 Classic respectively which actually justified their $40 asking price (even if KI 1 and 2 haven’t aged particularly well …). KI Season 3’s Ultra Edition, on the other hand, is pretty lame since you’re paying $20 extra purely for cosmetic stuff. If you care about costumes and colors, by all means, buy the KI Season 3 Ultra Edition. If you don’t, there is no reason whatsoever to buy the Ultra Edition so save $20 and just get the Combo Breaker pack. If you have never purchased any Killer Instinct content yet, you could also consider picking up the brand new Killer Instinct Supreme Edition that includes all of the Killer Instinct Season 1, 2, and 3 characters, plus KI 1 and 2 Classic, and everything else all for $60. Considering all of that content cost twice that much if you bought the Ultra Editions for each season, $60 is a pretty darn amazing price. The game has more than enough content now to justify paying $60, as well, so if you waited this long before jumping into Killer Instinct, the Supreme Edition is definitely the way to go. What's New In KI Season 3? New characters in Season 3 are sort of like a Microsoft All-Stars-esque lineup. At launch, classic Killer Instinct 2 characters Kim Wu and Tusk are available, along with The Arbiter from the Halo franchise as well as Rash from Battletoads (play Battletoads in Rare Replay). Coming in the next few months are General Raam from Gears of War, Mira (a new female vampire), and Gargos (the final boss from Killer Instinct 2). The final Season 3 character has yet to be revealed. Also not available at launch but coming soon is a new single-player mode called Shadow Lords, as well as a new multiplayer mode that will tie into Shadow Lords. In addition to new characters, modes, and stages, Season 3 also brings a ton of balance changes for the existing cast as well as a new visual look. The menus and character select have been overhauled and look better than ever, and I quite like the new purple and green color scheme. The graphics have been touched up as well, and new lighting in the stages really make them pop so you can see all of the detail that went into them. All of the existing cast have been re-balanced and tweaked as well and every old character has a new ability. One Season 3 addition we’re not so keen on is the Combo Assist option. With Combo Assist turned on, you only have to press a single button to use a special move or linker during a combo rather than having to also use the appropriate directional inputs for the move you want to do. You still have to use the right directional input for a special move to start the combo, but once the combo starts, single button presses continue it. The idea is that this eases players into Killer Instinct and lets them see the cool moves and stuff, but it doesn’t actually teach them how to play. You still have to time the button presses properly or else you drop the combo, so there is still some technique required, but if you don’t have to learn the complicated directional inputs you’re not really learning anything. Killer Instinct is already a very accessible, easy to learn game once you know the basics, and the game basically automatically does combos for you anyway. You still have to put in the appropriate moves at the right time, which you do have to learn, but you can kind of just mash buttons and pull off 15-hit combos without Combo Assist, so using it in hopes of seeing all the flashy moves and combos is pointless – you can do that already. I just think you’re better off learning the right way from the start instead of relying on combo assist. All in all, though, Killer Instinct is only getting better overall with the additions in Season 3. One last thing I want to touch on is how fantastic the cast is. Every character plays differently from the others and range from simple (Jago, Saberwulf, Orchid) on up to incredibly challenging and complicated characters like Aganos, Kan Ra, Hisako, Tusk, and others. Every character controls differently and has a unique style that makes picking up a new character a fresh fun challenge because you have to learn to play all over again. Right now, Killer Instinct has the most diverse cast of genuinely interesting and unique characters of any modern fighting game, which is why it is so fun to keep playing and keep learning. It is the fighting genre at its best, and it keeps getting better with each new mode and character that is added. If you like fighting games at all, you need to play Killer Instinct.